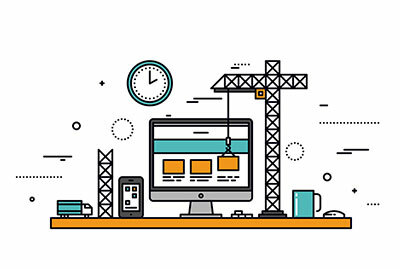 What are the steps involved in getting a website built for your business? If you're a small or medium-sized business, it's unlikely you'll have big budgets, teams of people, or lots of time to invest in a complex online strategy, but there are some simple steps you can take to start reaping the rewards of visible online. So we've had a look at how important it is to have a web presence, but you don't want to shoot yourself in the foot by spending time and money getting a website up and running, if all it actually does is show your company in a bad light. You don't need to have a huge budget to get something good – you can start small, and add to it later as your business grows. The most important thing to do is to put yourself in the user's shoes. Create a list of URLs of your competitors, and determine the strengths and weaknesses of their websites. What are your favourite websites – and why do you like them? Pick out a few sites that look the way you’d like yours to look, considering things like design, colour scheme, and layout. 2. What is your market? Create a clear understanding of your website’s users. A good way of doing this is with "personas" - they are a great way to pinpoint who your users are. Situation – when do they buy / use this product? Key information needs – what do they need to find out? Decision making factors – what influences them? You can create a few personas to help clarify your different market segments. This helps you to understand what you need to put into your website from a user's point of view. Make sure your users' needs are met. For example, do they need to reach you urgently or are you persuading them of your expertise? ...or a mixcture of the above. eCommerce site or 'brochure' site - will your site be an online store or simply a 'brochure' type site that tells people about your business? CMS – what is it? Why will it be cheaper for you? CMS stands for Content Management System. Many customers prefer to use a CMS as they have control over their own content, and it works out cheaper for them. WordPress is a type of CMS. It started as a blogging platform but is so easy to use, it's now a very popular platform for developing all types of websites. Bespoke or theme – what's the difference? Have a look at some of the themes available from businesses like ThemeForest and Template Monster. You can't just download a theme and start adding content – you'll still need to get a web developer to configure and customise it for your brand. Buying a theme saves your web developer time and therefore saves you money. BUT there are drawbacks – a theme can drastically limit your choice of website design and functionality. Also, if you decide to make big changes to your theme, you are adding web development time which costs you money. Responsive or not? - our website MUST be responsive, i.e. configured to display properly on mobile devices. Over 50% of John Lewis online sales are now made on mobile devices, and this figure will only increase. It makes sense to get responsive design built into your site upfront so it's future-proof. We see URLs all day every day. A URL (Uniform Resource Locator) is basically a web address. You can select and buy your domain through a website that sells domains e.g. www.123reg.com, www.1and1.com, www.godaddy.com, or through your hosting company (more about hosting below). You may have to compromise on the exact name, as your first choice may be gone. There are now a large amount of TLDs available e.g. .photos .clothing .kitchen. It might be worth buying a few TLDs e.g. .co.uk, .net, .co, .org to save competitors snapping them up. You're renting the domain name, and the rental lasts 1-2 years. Make sure you renew it, or it's gone. Expect to pay between £3 - £30 + per year, depending on the popularity of your name. Make sure there are no howlers! Like domain registrations, there are many companies that offer website hosting with varying pricing. Web hosting companies own huge servers with lots of space for websites to 'live', and they basically rent out space on these servers. Web hosting is generally charged to you on a monthly or annual fee. You can ask your web developer to arrange this for you, for you can arrange it yourself. If your web developer does it for you, make sure have a copy of the information you need to access all your files, in case you ever want to change developer. You will need the username and password to the place on the server where your site is hosted. Larger hosting companies will offer cheap deals but as with any cheap service, you may not get the best customer service. The amount you pay depends on the size of your website. A large eCommerce website, for example, will cost more than a small site with five pages of content. This is because you're taking up more space on the hosting company's server. For a very basic website, expect to pay from £8 per month. Examples of hosting companies are 1and1, Fast Hosts, GoDaddy, United Hosting. Do you 'do it yourself' or pay a professional web developer to do it? Play to your strengths – if you have some design or coding experience then give it a try. If not, we suggest you get it done properly! Consider your needs, your technical abilities, and your budget when making a decision about how your site will be created. You only get a few seconds to convince a web visitor that they’ve come to the right place so it’s important that your website reflects professionalism. An "amateur" website isn’t likely to give you the results you’re hoping for. Investment in your own website will improve your bottom line in the long run. The more you can tell your web developer about what you want, the better – you'll get a more accurate quote and will end up with the website you want. What should you put in it? See our client questionnaire which was the subject of a previous blog post. As with any purchase you make, you should send exactly the same brief to a number of web companies, so when you get the price back you are comparing like with like. Check to see if you've been given a quote for the entire job or at an hourly rate. If it's for the entire job, see what's included. We recently met a small business owner who had asked web developer to design and build a new website. The business owner was shocked that the web developer wouldn't be designing the logo, writing the words, and arranging the photography. They thought all this work was included in the quote – which led to both him and the web developer parting on bad terms. So check what's included and what isn't. Good web development companies will check to see what you will be providing, and if you have any gaps they will supply a quote for the missing elements. Consider deadlines. It's always worth giving yourself and your web developer a deadline, otherwise jobs can drag on. Between you, you'll agree the 'architecture' of the website. Different web design companies will use different processes at this stage. For a bespoke website, good practise is for them to supply you with a wireframe so you are both agreed before they even start coding. If you've gone for the 'theme' option, the web developer will purchase the theme at this stage. Your web developer should design your page layout (especially the home page) with a hierarchy in mind. as the reader moves lower on the page they notice the information about the business. There should be plenty of space to make it easy for users to scan through and find the relevant information. Resist the temptation to cram everything in, and think about what the users are actually looking for. Create a call to action on every page. Include an “about” page and testimonials to identify yourself and appear more human. Make your contact information very easy to find. Again, find out up front if you or your web developer are responsible for supplying the images for your website. If you are supplying your own, try to find compelling images that match your branding and company image – consistency is key. A good quality image can make a website look instantly professional (and of course, the reverse is also true). All image files should be low resolution (72dpi) and saved for web. As a rule of thumb use GIF format for computer-generated graphics such as simple logos, buttons or animations, and JPEG format for photographs or scanned material. Try websites like iStockphoto or Shutterstock for cost-effective stock imagery. Images usually start from a few pounds each. Avoid poor quality images of any kind – it's better to not show anything than to show something pixelated, badly resized or low resolution. If possible, use photos that have a single main subject. Photos of people are good – people relate to seeing other people. Even though photos of people are good, try to avoid clichéd “business people shaking hands” photos! You can have the best looking website in the world, but if you’ve got spelling and grammar errors, nobody will take you seriously. Proofread everything, then get a colleague to go over it again. Break the text down into separate sections to minimise individual pages. Use short, precise words in your navigation links (e.g. About Us, Services). Important navigation links should remain constant on every page and organised in order of importance. Of course you want to be memorable, but don’t be fooled into thinking a fancy font is the way to do it! Stick to reliable fonts like Arial, Helvetica, Georgia or Verdana, or web-safe ones like Google Fonts. For text and heading styles, stick to one or two typefaces and two or three type sizes and colours. For ease of use, keep link colours in line with the page colours. Don’t use all-caps text for anything other than a heading. The loading time of your pages. Loading speed is key to getting repeat visitors (and in our experience, anything over 15 seconds is too slow). This is one of the reasons you need 72dpi images saved for web. Huge images will make the page loading time too slow. Check the 'depth' of your pages – how many clicks does it take to reach any page? The fewer the clicks, the better. Check your browser compatibility (does everything still work on IE, Chrome, Safari, Firefox etc.)? 8. What happens after it's built? Once the site is up, what’s next? Regardless of whether you build it, hire someone, or a combination of the two, traffic won't just arrive on its own. You'll need to use marketing tools and tactics to promote it.